The Affenpinscher is a typical Terrier type dog. They are usually very lively and bursting with self confidence. This is a wonderful breed with a typical Terrier type character, but if he is not socialised and trained early, the Affenpinscher can quickly be ruling the household and everything in it. Coat: Dense coat, rough, harsh, wiry. 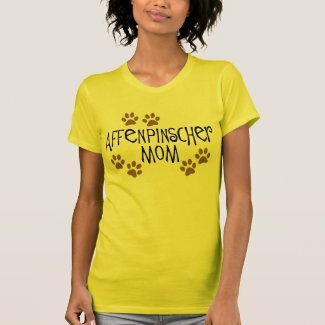 Affenpinschers may be black, gray, silver, red, black and tan, or beige. Black affenpinschers may have a rusty cast or a few white or silver hairs mixed with the black. Red affenpinschers vary from a brownish red to an orangey tan. Origin: The Affenpinscher originated in Germany around the 1600s. It was originally bred to hunt vermin around the kitchens and stables. The AKC recognized the affenpinscher in 1936, but the affenpinscher’s popularity was stifled by World War II. Since then, the breed has remained extremely rare even in America and Germany. Litter Size: 1 – 3 puppies. Average 2. Intelligence: The Affenpinscher is an intelligent, busy little dog who loves to play and chase balls. They are very confident and strong-willed. This makes their training a slightly challenging experience for most owners, but an enjoyable one in most cases, and the average well-informed owner should manage perfectly fine. The small size and weight of this dog removes the chance of a physical struggle which owners can have with larger breeds during training or when overcoming behaviour problems. 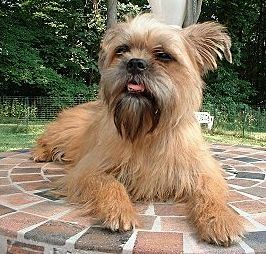 The Affenpinscher needs an owner that can be firm from the beginning. The Affenpinscher can be notoriously difficult to housebreak. For some unknown reason, this breed of dog has a fixation for eating whatever is low enough for the dog to see, and small enough to fit into its mouth; bugs, food wrappers, plants, pebbles, etc. Obedience training is not impossible with an Affenpinscher, it only seems that way. Maturity is a big factor when it comes to obedience training. Younger Affens do not accept the will of owners readily, until they become mature (emotionally and physically). They are smart, often too smart, to be readily trainable. Often it is a contest of wills, to teach an Affenpinscher new behavior. The Affenpinscher requires more socialization with humans than perhaps any other breed of dog. A lack of socialization will create an almost schizophrenic-like behavior in the adult Affenpinscher. Behavior is something you can modify to a point with training and conditioning. The rest of it depends on the intrinsic breed traits passed on in the genes. Affens can become agitated by “perceived threats,” meaning that the dog thought it was something to get excited over. Their reactions vary widely from individual to individual, to such things as noise, people, other animals, movement around them, and children (a category by themselves). Some Affenpinschers react to these stimuli with minimal notice, while others may become hysterical. The peculiar thing is these individuals can and do, come from the same litters, having experienced the same sensory input as neonates and puppies; yet react on different ends of the spectrum behaviorally. Tendencies for erratic, nervous reactions to stimuli do however, exist in all members of the breed. Health Concerns: Affenpinschers are fairly healthy dogs all round, though their small size and light frame makes them slightly vulnerable to broken bones, particularly in the front legs. Number one as far as recorded occurrence is patellar luxation, or sliding in and out of place with the knee assembly. It can cause degrees of damage from dog to dog. The worst cases of luxation require surgery to prevent crippling pain and arthritic changes. Other orthopedic problems include Legg-Perthes disease and Canine Hip Dysplasia (once thought to only affect large breeds) that have a distinct impact on the breed. There is an inherited tendency for hernias in some lines of Affenpinschers, as well as some endocrinology issues like hypothyroidism, and impaired immune systems. Some lines have tendencies to develop sebaceous cysts as well. Opthalmic disorders include: early onset cataracts, corneal ulcerations, and rarely, glaucoma. The number two health issue in Affenpinschers is heart problems. In attempting to identify some of the heart conditions, I have seen necropsy reports citing: PDA (present at birth and correctible by surgery), Prolapsed Mitral Valve, Cardiomyopathy, and a few others. Liver Shunts have been reported, and are also in the fatal category, though some are milder, operable, and/or treatable. Veterinary texts list von Wildebrand (a potentially fatal bleeding disorder) in the Affenpinscher, also. These diseases sound enormous in scope when seen in writing, but in actuality, are less in number than those existing in a vast majority of breeds. Special Nutritional Needs: Low, not particularly fussy eaters. Sometimes not fussy enough, and have frequently been known to eat inappropriate items which could require pumping of the stomach. Grooming: The coat requires frequent brushing and periodic bathing, but should never be clipped. Neat, but shaggy, the affenpinschers’ rough coats are about one inch long on its body and somewhat longer on its head, neck, chest, stomach and legs. The affenpinscher’s coat requires combing several times (at least two or three times) weekly. Temperament Traits: The Affenpinscher is a typical Terrier type dog. They are usually very lively and bursting with self confidence. This is a wonderful breed with a typical Terrier type character, but if he is not socialised and trained early, the Affenpinscher can quickly be ruling the household and everything in it. Energy Level: The energetic and active affenpinscher needs moderate exercise, such as vigorous indoor games, romps in the yard, or short walks on a leash. The affenpinscher enjoys being outdoors, but it should live indoors. Good with Children: The Affenpinscher is not particularly good with young children as it is a prey-driven dog which can cause them to tug, chew and be quite playful with things, such as loose clothing! They do not particularly like small children. They can, and will bite if provoked. However, as with any breed, with the correct introduction and handling, the Affenpinscher is fine to have with youngsters, though we would suggest it is better suited to someone with at least a medium level of experience in dog training if there are very young children in the household. Watchdog (bark) / Guard Dog (aggresiveness): The Affenpinscher makes a good alert dog and you will always know when someone is nearby or approaching the front door. The Affenpinscher can sometimes show some dislike towards strangers and other dogs, so early socialising is important. Like many Terriers, this dog does bark a lot but this can be controlled through good training. 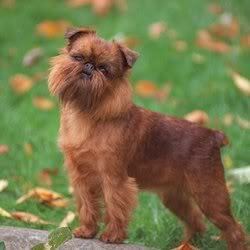 Good Hunter / Retriever / Tracker: The Affenpinscher was originally bred for hunting vermin. Today it is primarily a companion dog, but retains a high prey drive instinct. History: The Affenpinscher originated in Germany, where it was bred to hunt vermin, and as a companion dog.